Advanced, Beginners, How do I, Intermediate, Product reviews. permalink. I was given this program by someone after days of me tweeting about my H: Drive screwing up on me. I’m usually pretty good with computers and I love working on them. I’ve tried I don’t know how many programs to fix the issue and nothing really worked. 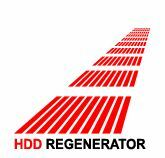 That being said, I must admit, I’m already pretty amazed at HDD Regenerator. I’ve been in “Scan and Repair” mode for a little over 2 hours and… WOW! I had no idea how many bad sectors were really in my H: Drive. I’m already noticing a bit of improvement. I highly recomend this program. One of the best parts is how easy it is to figure out. My computer illiterate friends can figure out what to do very quickly. Overall, it’s just awesome. It pays for itself 10-fold when you consider the price for a new hard drive. Expect to wait for a while though, especially if you have a LOT of damaged sectors. I have a question for PC Repair Man’s. 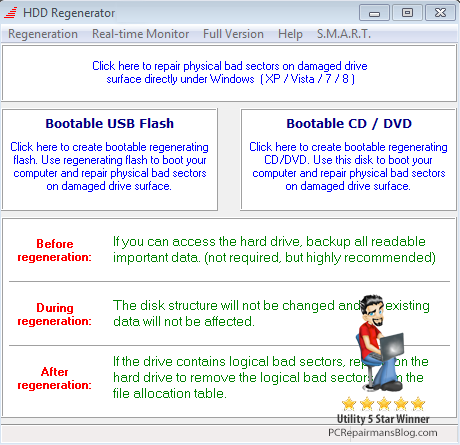 Understanding that HDD Regenerator is effective in making a hard drive healthy by repairing bad sectors with magnetization errors, what percentage of the fixed (and now healthy) hard drives have remained without the bad sectors reappearing in a short or moderate time? Hi Alberto. It’s a good question. You will find that if a hard drive is making strange noises then running HDD Regenerator will generally not work or will initially work and then the drive will fail later. This is normal and not a fault of the tool. A healthy drive will have a 100% success rate in our tests and sector errors do not reappear unless the user powers off the machine while the drive is writing (which is often how they appeared in the first place). If you can’t get into Windows then run HDTune (free) or similar from your boot environment to get your SMART info, then run HDDRegenerator. I would like to clone a hard disk on a macine that has a windows xp home intsalled. it has some 15 MBytes of bad sectors and the cloning software will not clone If I fix with this approach, will it let it clone? The format is NTFS and Dell installed a 47MB FAT16 partition that I ignored to be able to clone the windows OS part in NTFS so I suppose the bad sectors are in the FAT16 part. Do you have this knowledge to share? Thanks for all or any information – it is a very interesting subject at least tha got me interested since I read DISK Mysteries in 1980. In those days we had to deal directly in the FAT table byte by byte. Cloning software usually fails at the point where it is told to read bad sectors. Some let you carry on but this is not advisable as the data may be part of the OS or your other important files. In my workshop we run HDD regenerator to fix these bad sectors and the disk clone then completes as it should. Repairing the disk allows you to backup and clone any partition including the recovery one. Up and running! After clicking your link to get the trial copy, I downloaded it, then created the bootable USB that your article showed me. Booted up from it and it ran for about 3 hours on my huge 2TB drive. It found 5 bad sectors and repaired them all. Rebooted into Windows and all my files are there, can’t thank you enough as they are mostly client image files for my photography job. Just thought I’d say a huge thank you. This worked for me after PC World ‘experts’ said the drive was too damaged. A scan of about 3 hours by HDD Regenerator automatically repaired the bad sectors on my drive & left me able to boot into Windows again and get to my college files. Many, many thanks for your help!